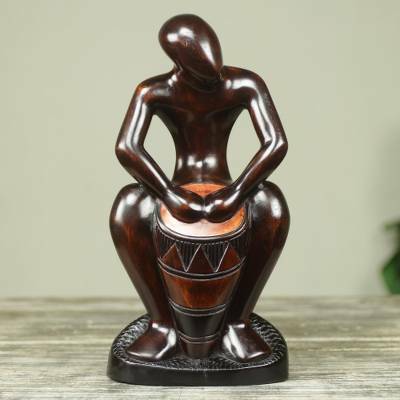 Original Ebony Wood Sculpture of African Drummer, "Kpanlogo Drummer"
Artist Lawrence Kattah of Ghana hand-carves this image of a kpanlogo drummer from ebony wood. Kpanlogo is a recreational dance and music form from Ghana. It was first played by the Ga ethnic group, most of whom live in and around the capital city, Accra; but it is now performed and enjoyed throughout the country. The artist details the drum beautifully and captures the fluid gestures of the drummer. Lawrence Kattah has received 2 microcredit loans with 0% interest from Kiva and Novica, the first for $200 and the most recent for $250. These pieces are quiet impressive. Love, love, love! "Great piece of art work for new home"
"Amazing detail and quality "
Certainly exceeded my expectations. This is a beautiful piece of art. Gorgeous piece. Exceeded my expectations. "I have plans to open workshops across the country, to create employment for the unemployed. My biggest dream is to become a well-known artist and establish an art school." “I am Lawrence Kattah, and I was born at Aburi in the eastern region of Ghana. I am considered a hardworking and trustworthy person. I create sculptures and musical instruments. Art is an innate gift, and out of passion I found myself in the art business. I learned this skill from my eldest brother. I have taught a couple of apprentices, and I also assist visual arts students with their practical works. “My favorite thing about my art is the quality and uniqueness. 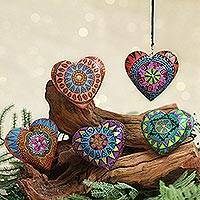 I use sese wood, iron rod, and acrylic paints to produce my items, and they are easy to work with. The challenge is the difficulty in obtaining the raw materials, and also in the marketing of my items. I am inspired by the Almighty God with the designs I create.